After completing an engineering apprenticeship with Ford, Bob decided he wanted a career that would offer more variety and excitement. In 1983 he joined the Metropolitan Police, where he served in the east end of London. Bob specialised as a protection officer, serving with the diplomatic protection and royalty protection groups. From 1991, Bob also worked as a counter terrorist search officer, performing defensive searches all over the country, as well as evidential searches at the scenes of terrorist attacks. In 2004, Bob opted for a change in role, still specialising in counter terrorist search but now as an explosives search dog handler. In 2005 Bob was the first officer on scene at the July 7th terrorist attack on a bus in Tavistock Square, where 13 people lost their lives and many others were critically injured. 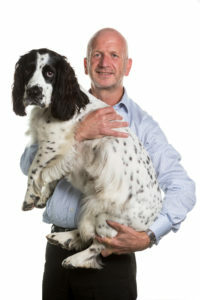 There was believed to be a secondary device on the bus, and in the absence of an explosive ordnance disposal team to declare the bus safe, and a critical need to allow first responders access to the bus to tend to the wounded, Bob and his cocker spaniel Jake entered the bus without a second thought for their own safety. They conducted a full search until Bob was able to declare it safe for the first responders. As a result of their bravery in the face of extreme threat and horrific scenes that day, Bob’s dog Jake received four national awards – including the animal’s George cross, which is the highest animal bravery award available. As well as further specialisations in searching in a marine environment, Bob became involved in the training of search dogs, completing his 35 years’ service at the prestigious Metropolitan Police Dog Training Establishment. After such an incredibly rewarding career, during which time you made a significant positive difference, you could have chosen to do anything…why did you choose to join SafeLane Global? After such a rewarding career, I felt the time was right to move my passion for training dogs in a different direction. SafeLane Global has given me that opportunity. With around 150 dogs working on projects around the world, and the intention to significantly extend its canine operations, SafeLane Global will certainly present some exciting challenges for me to ensure the maintaining of the high standards I set for myself and the dogs for which I am responsible. How has the induction and on-boarding process been? After working for the government for over 35 years I was unsure what to expect of the private sector. My induction and the on-boarding process at SafeLane Global has been incredible however, and cemented in my mind that it’s definitely the right place for me. So far I’ve spent time with every single member of staff at HQ, getting an insight into their role within the organisation. This not only made me feel extremely welcome, it’s enabled me to hit the ground running and get straight to work, guiding everything canine within the organisation. As part of the on-going induction, I will now be travelling to meet key personnel on projects around the world. What challenges and opportunities does your new role present? This role will undoubtedly present many diverse challenges, not least because in some of the areas of the world in which SafeLane Global operates, cultural attitudes towards dogs differ from what I am used to. I hope that by insisting on the highest standards for our dogs, we can actively demonstrate how useful our dogs are in ensuring the safety of all personnel on our projects. What are you most looking forward to achieving at SafeLane Global? From a personal point of view, the prospect of travelling all over the world, working with dogs alongside our colleagues who share my passion for dogs is extremely exciting. How are SafeLane Global’s canine training and programmes and operational projects unique? My goal is to ensure that all SafeLane Global dogs are consistently cared for to the highest standards, and a rigorous continuation training regime is maintained in order that our dogs continue to make a positive difference and save lives. SafeLane Global has a unique set-up for providing superb search dogs to projects around the world. It has its own purpose-built training school in South Africa. From here we can train our dogs to a consistently high standard, above and beyond what is required by our clients, before we deploy working teams across the world. Once our canine teams are on a project, we have a team of dedicated dog trainers who ensure that continuation training maintains the highest standards.